The early sunsets, short days and long nights of autumn will be coming to an end this upcoming Sunday, December 21st. The earliest sunsets of the year occur during the week leading up to the winter solstice and on the shortest day of the year the sun sets at 4:32 PM and rises again at 7:17 AM the next day here in New York. Starting on the 1st day of winter the days become longer and of course the change happens far too slowly to be noticeable until several days later. The longest night of the year is called شب یلدا / شب چله - Shab-e Yalda/Shab-e Cheleh in Persian. 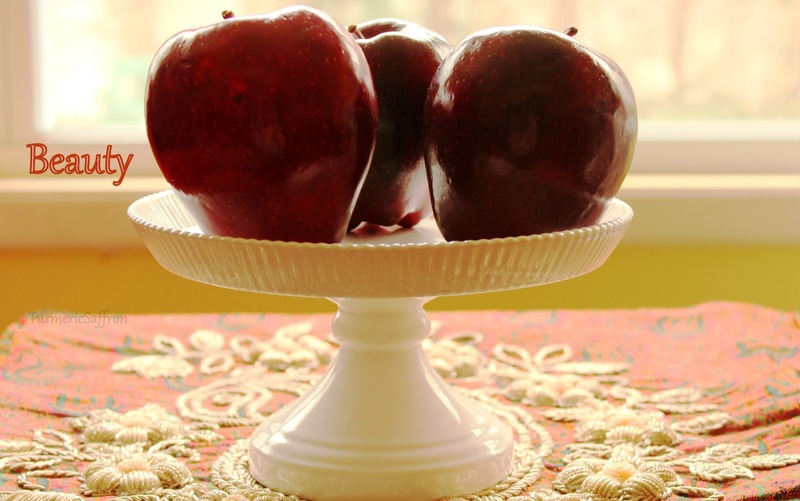 The word Yalda means birth and it refers to the birth of Mithra (god of light and justice) thousands of years ago. 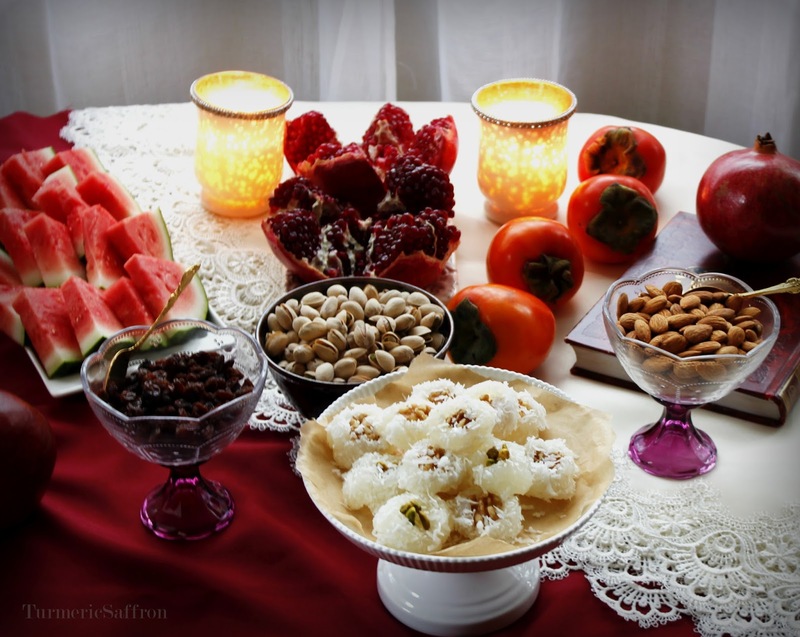 Traditionally, the night of Yalda is celebrated with friends and family gathering around a کرسی - korsi or سفره - sofreh (tablecloth) spread or a table with festive fruits such as a bowl of ruby colored pomegranates, a platter of sliced sweet watermelons and fully ripened delicious persimmons. 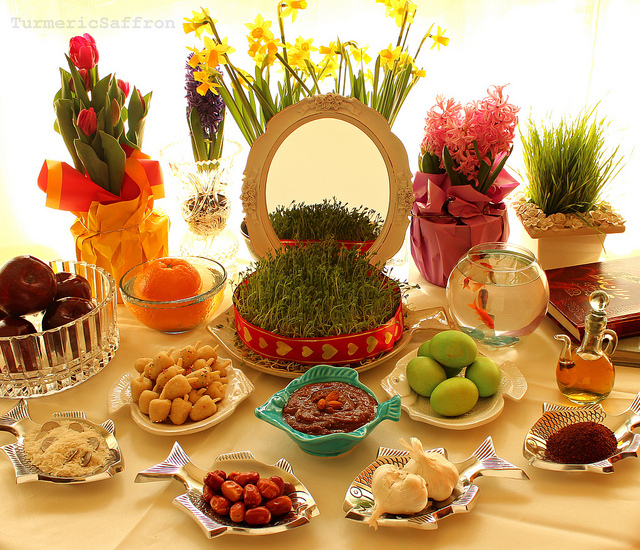 Also, on the table would be a bowl of ajil (nuts, seeds and dried fruits), sweets, and poetry by Hafez. This festival usually starts after dinner and continues into the late hours of the night with poetry reading, storytelling and music to celebrate the victory of light over darkness, the start of a new season, and to make the long hours of the night go by faster! For me, it is also a way of honoring all those who have celebrated Yalda long before us, during the cold and dark nights of winter huddling around a little oil lamp or a wood burning fire pit with limited food. And yet they still managed to keep the spirit of shab-e cheleh alive for many centuries to come. 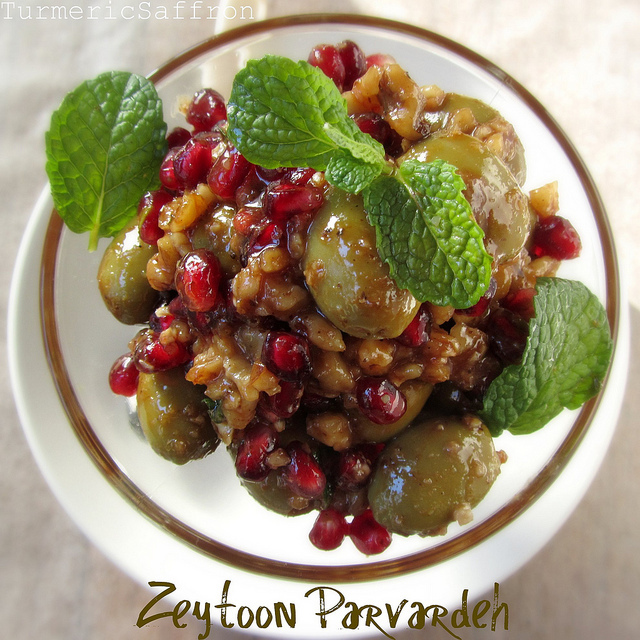 There are no specific meals or dinner menus associated with Yalda celebrations and in all these years of blogging I have never felt a need to write a recipe for Yalda until now. It is all up to you as to what to prepare for the night. 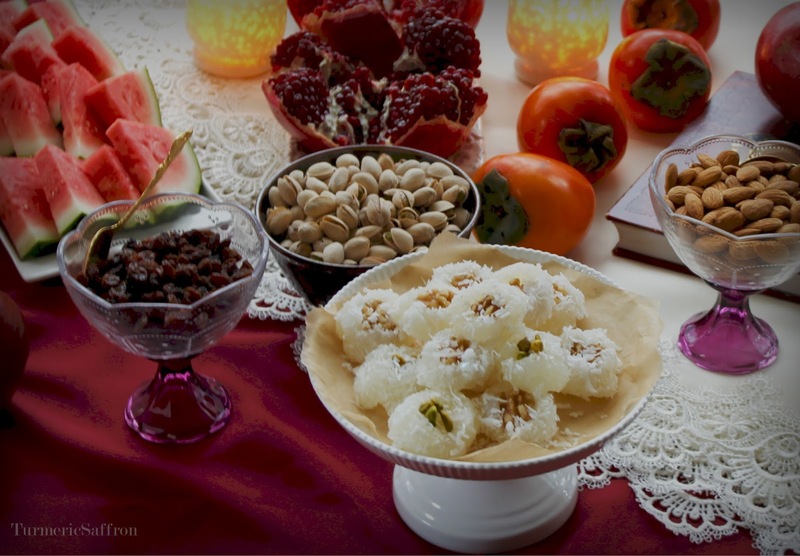 However, among the sweets served, baslogh is commonly known as a yalda shirini (sweets). 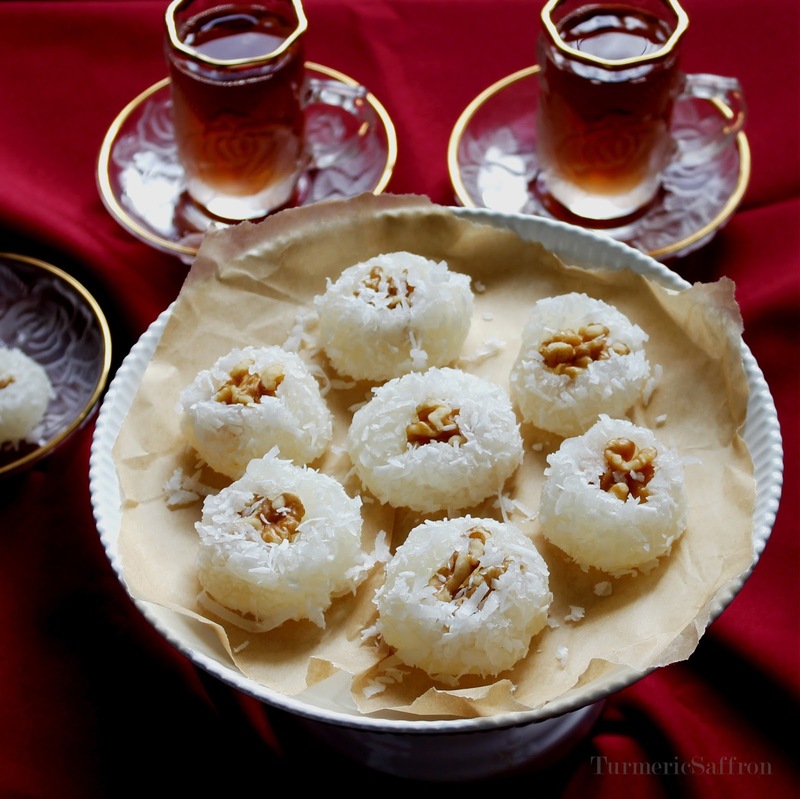 باسلوق لقمه ای - Baslogh is a soft starch based candy infused with rosewater and each individual piece is completely coated with shredded coconuts and topped with walnuts. 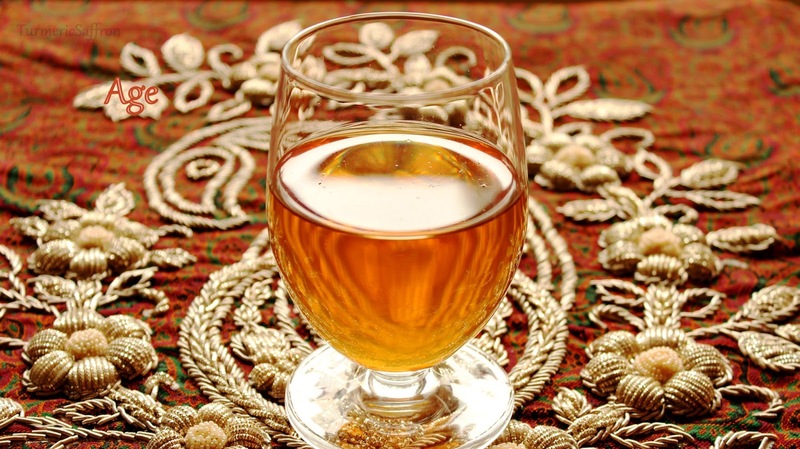 In addition to rosewater, saffron and ground cardamom may be used as well. 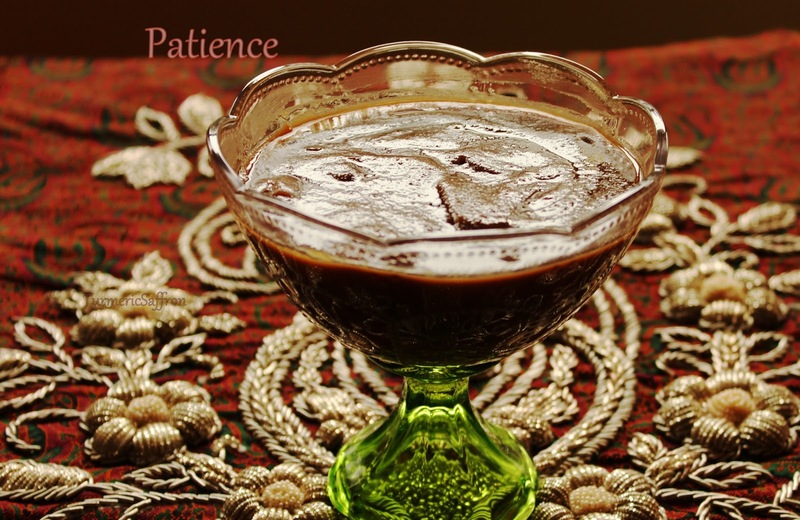 For this recipe you will need a little patience as it does require constant stirring. Pour the shredded coconut into a large bowl. Set aside. Combine sugar and water in a medium saucepan, bring to a boil over medium-high heat until sugar is completely dissolved. Reduce heat and simmer. Mix cornstarch and a 1/2 cup of cool water together in a small saucepan, stir until dissolved. Add dissolved cornstarch to the sugar syrup. Bring to a boil, stir constantly until the mixture is no longer lumpy. Reduce the heat to low, simmer, stirring frequently until thickened for about 15-20 minutes. Add the rosewater, butter and lemon juice, cook for another 5-7 minutes. Stirring constantly. Drop a spoonful at a time of the mixture into the bowl of shredded coconut, shape the mixture into balls, turning over to evenly coat the sides. You need to move quickly. Place a walnut half in the center of each baslogh. Arrange on a serving platter. Serve with tea. 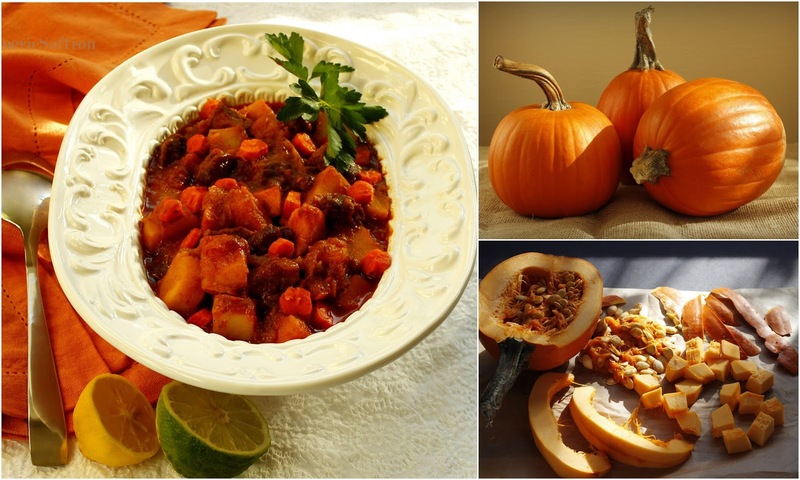 One of the beauties of fall is the abundance of many varieties of winter squashes that come in different shapes, sizes and colors. 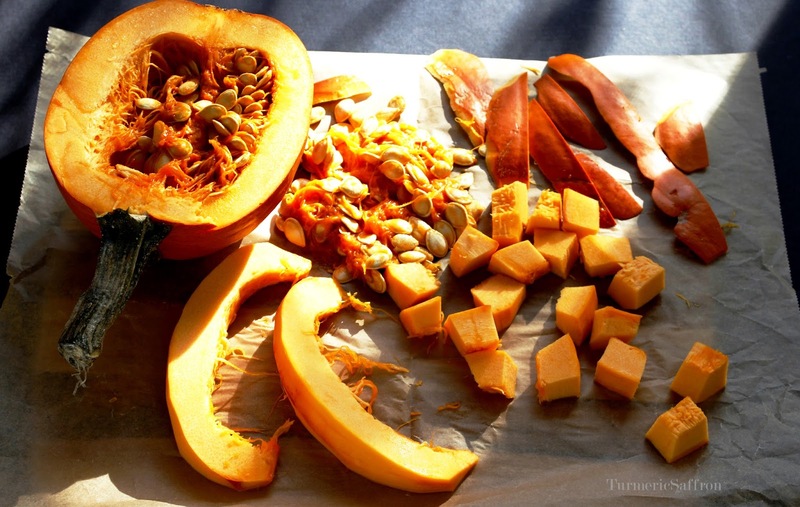 I typically use butternut squash for its flavor and color in my cooking however this time I chose to use کدو حلوایی - kadoo halvaie, the vibrant orange small sugar pumpkin that is both beautiful and delicious. It is the same kind of pumpkin my mother used to roast in the oven back in Iran and now when I cook it it still has the overwhelmingly familiar taste of home. 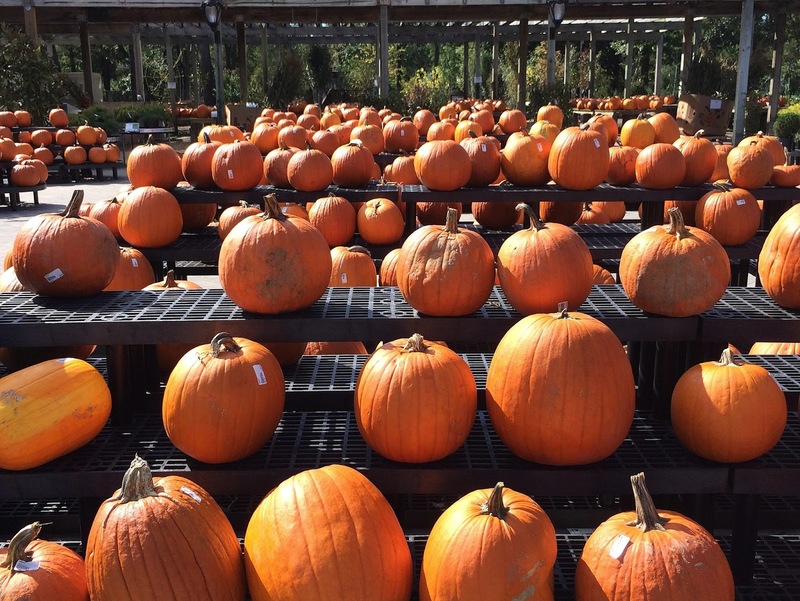 Orange is a joyous color and pumpkins are nature's gift; a free dose of color therapy on these gray, short and gloomy autumn days. I'm thankful to my lovely neighbors for leaving out all these gorgeous pumpkins on their front porches early on in the fall season until they eventually become food for the squirrels. There are a ton of sweet pumpkin dessert recipes out there. 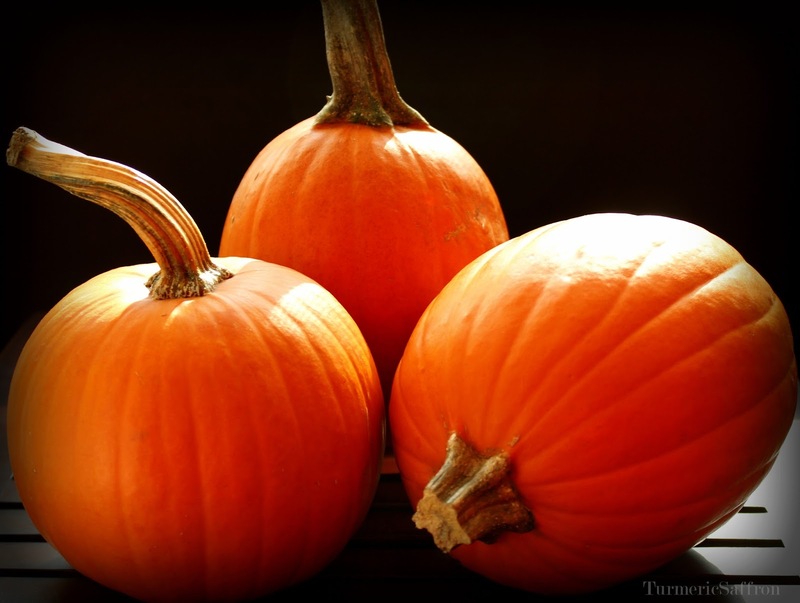 However, pumpkins are also delicious in savory dishes as well. 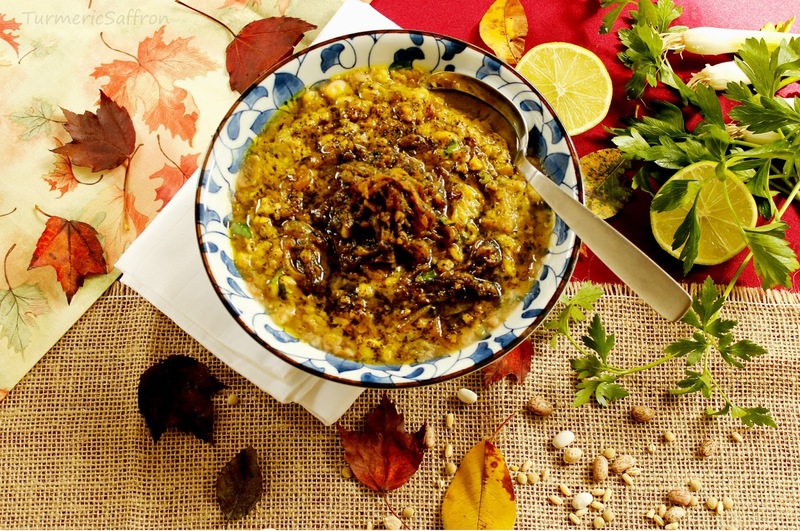 خورش کدو حلوایی - Khoresh-e kadoo is a ملس - malas (sweet and sour) fall flavored dish that will warm your heart. 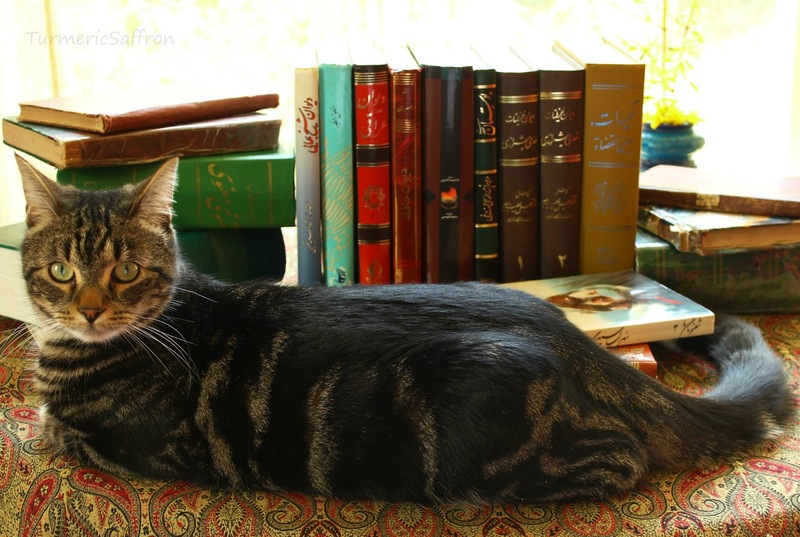 I'm often asked if there are any Persian vegetarian or vegan recipes. Most people may not think of Persian cuisine as vegetarian/vegan friendly and only think of کباب - Kabobs when they think of Iranian food. Or there may not be many obvious vegetarian dishes on restaurant menus. 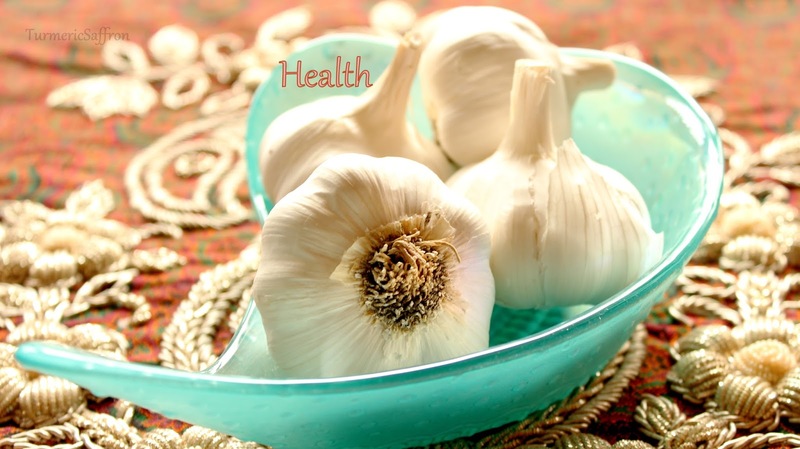 However, there are many types of fresh vegetables that are served raw or cooked as a side dish. Just to give you a sample check out this link to my vegetarian recipes. As for vegan recipes, I'd like to point out that you can easily omit the meat in many stew recipes that call for stewing lamb/beef, except for the traditional آبگوشت abgoosht/dizi varieties, and still have a delicious and fulfilling meal. I added a handful of آلو بخارا - aloo bokhara (dried yellow plums) to the stew toward the end of cooking. They may be found in most Persian/Middle Eastern grocery stores. If not, you can substitute them with prunes instead. 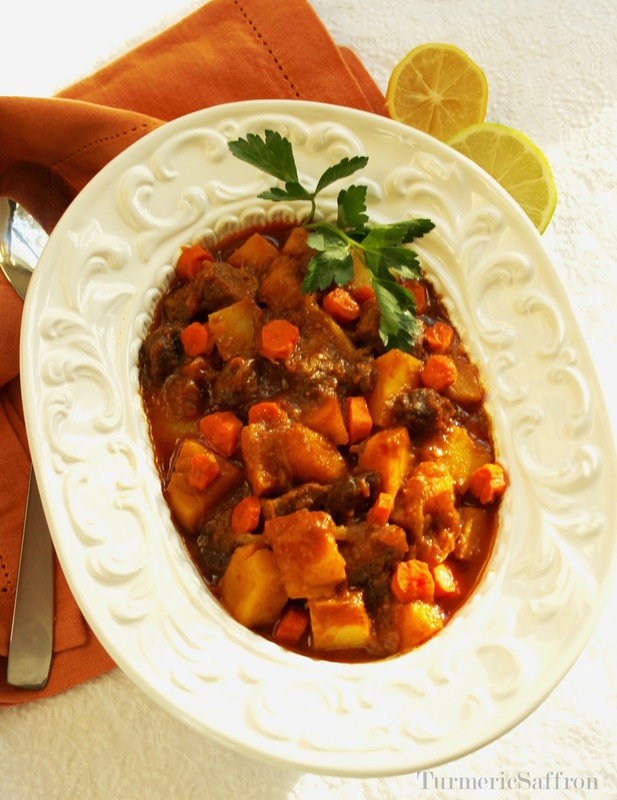 Typically, potatoes and carrots are not a part of the authentic version of this khoresh but they make the stew more rich and flavorful without changing the overall taste. I also like to add a bit of nutmeg and cinnamon. 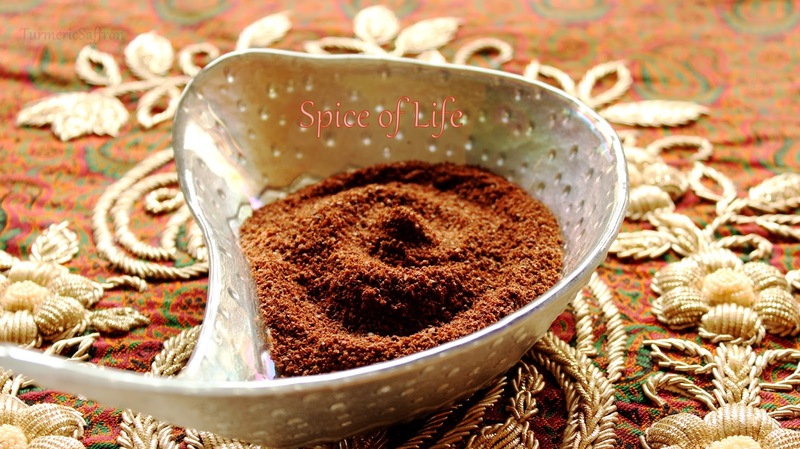 جوزهندی - Nutmeg is not a commonly used spice in Iranian cooking but in our home it was one of the spices that my mother cherished and she always kept some in her little glass spice jars. In a large skillet heat 2-3 tablespoons of oil, add pumpkin and saute lightly for about 7 minutes. Stir in cinnamon, a pinch of nutmeg and a dash of salt. Cook for another 5 minutes. Set aside. In a large pan heat 3 tablespoons of oil, add sliced onions and saute over medium-high heat until golden. Add minced garlic and saute for a couple of minutes. Add the turmeric powder, stir and mix well. Add beef and cook until brown on all sides, stirring occasionally. Add chopped tomatoes, tomato sauce, 1 teaspoon salt and 1/2 teaspoon pepper. Add water to cover all ingredients by about an inch, mix well. Bring to a boil on high heat, lower the heat, cover and cook over medium heat for about 45 minutes or until tender. Add in the sauteed pumpkins, potato and carrots to the stew. Add a little bit of water if necessary. Cover and cook for another 30 minutes over low heat. Add in the plums, lemon juice and sugar. Stir well, taste and adjust the seasoning, simmer for another 10-15 minutes. 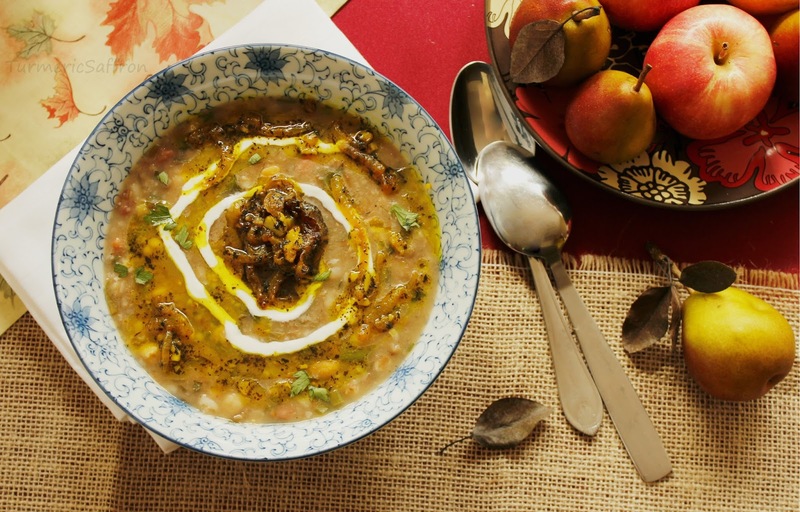 Serve hot with rice, mast o khiar, and sabzi khordan. 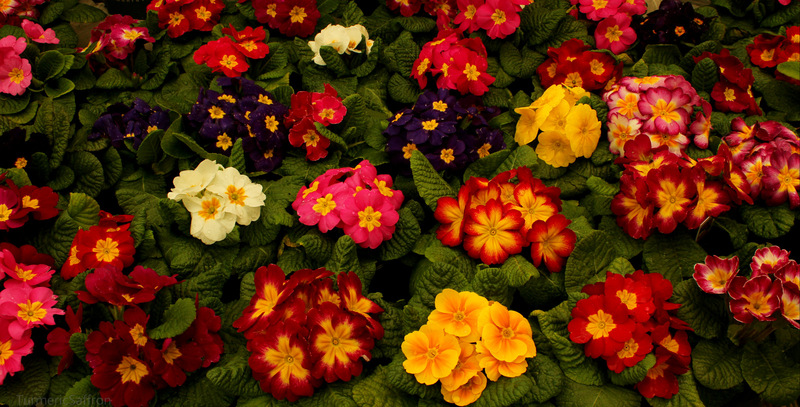 Mehregan/Mehr is an ancient Iranian festival celebrating the start of the beautiful fall season. 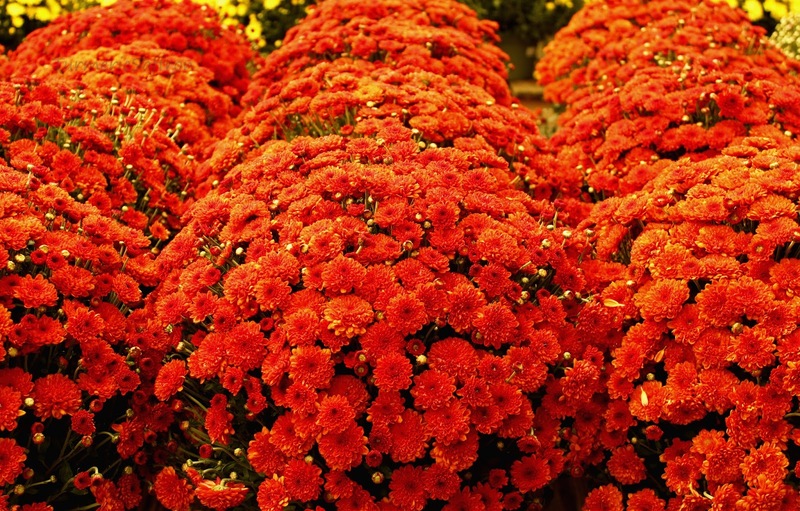 With its vibrant foliage, crisp days, and harvesting of crops, مهرگان (Mehregan) is traditionally celebrated a few days after the first day of fall (Autumnal Equinox) on the 10th day of (Mehr) (the seventh month of the Iranian calendar). 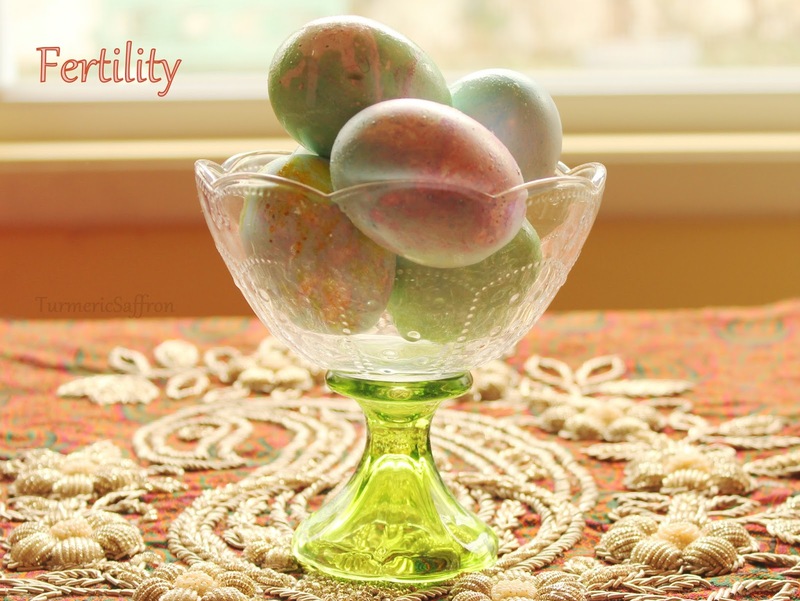 In the past, festivities would last for several days. Opinions about the exact date of Mehregan may differ since the historical records show that the date has been changed a few times throughout history. The wordمهر "Mehr" in Mehregan means 'sun, kindness, love and friendship' in Persian. 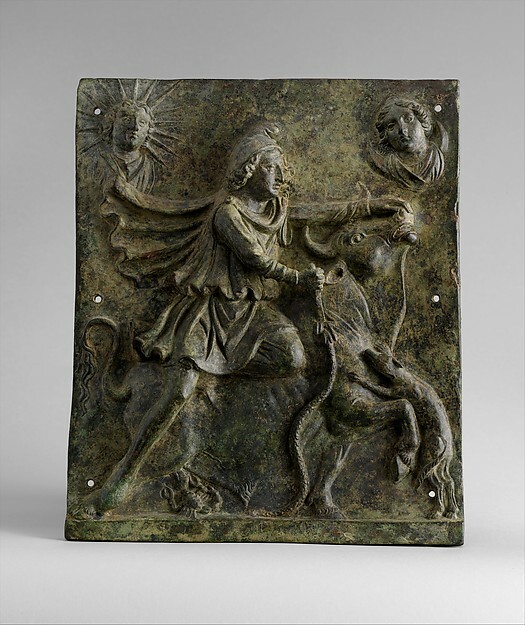 جشن مهرگان Jashn-e Mehregan is attributed to Mithra/Mehr, the goddess of the sun and brightness and also the angelic divinity of friendship, justice and oath dating back to the ancient religion of Zoroastrianism. One of the most valuable lessons of prophet Zartosht (Zoroaster), that is still cherished today, is his teachings of good thoughts, good words and good deeds. 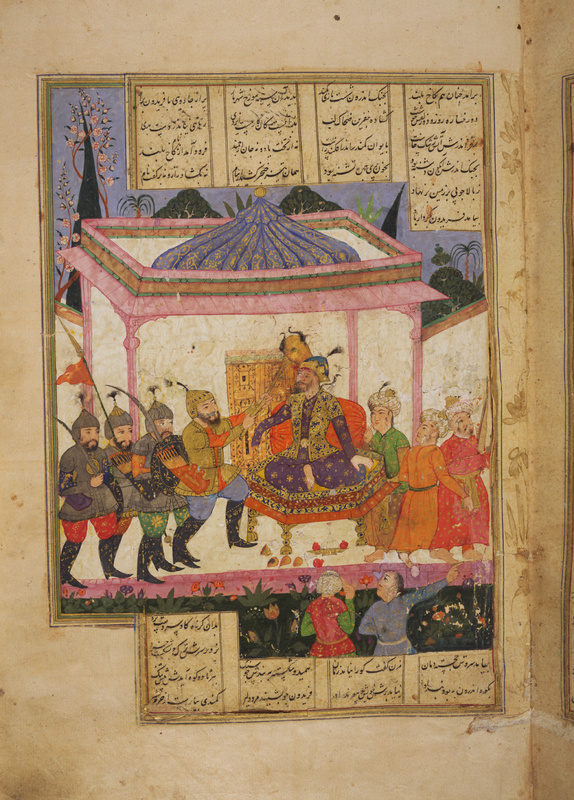 It's also believed that Mehregan marks the triumph of Kaveh Ahangar, the blacksmith who fought the tyrant king Zahak and defeated him, saving the people from his brutal reign which resulted in the crowning of Fereydun as king in the epic Shahnameh (Book of Kings), written by the great Persian poet Ferdowsi. Therefore, Mehregan is also considered a day when good destroys evil, a common thread in many old Iranian fables. 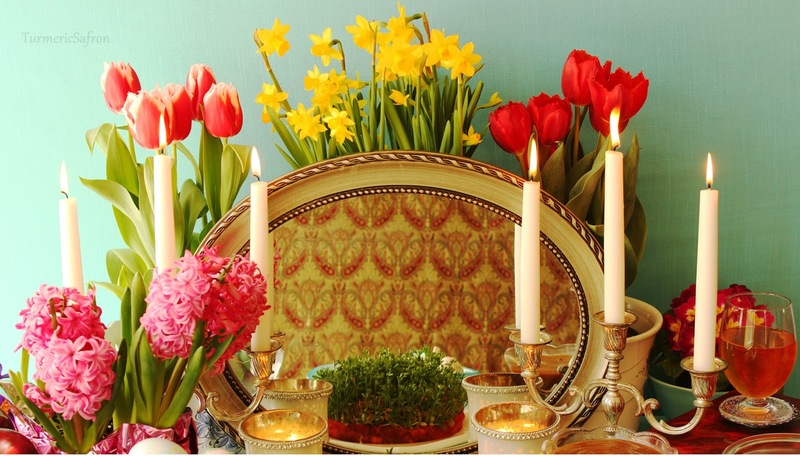 Growing up, my family celebrated Nowruz (Persian New Year) and Yalda (the longest night) every year more grand than the year before. However, I don't have any recollection of any Mehregan celebrations. I can't think of a particular reason why we didn't celebrate Mehregan at home other than perhaps the timing of it being inconvenient for my parents. The first day of fall is the first day of school in Iran. My guess is that for my parents having to deal with a bunch of kids and getting each of us ready for school must have been overwhelming enough around that time of year! And so when the dust was settled Mehregan had come and went. Now, more than ever, I'm passionate about paying a long overdue ode to this centuries-old Iranian festival for the purpose of introducing it to my children as well as others and preserving it for future generations. 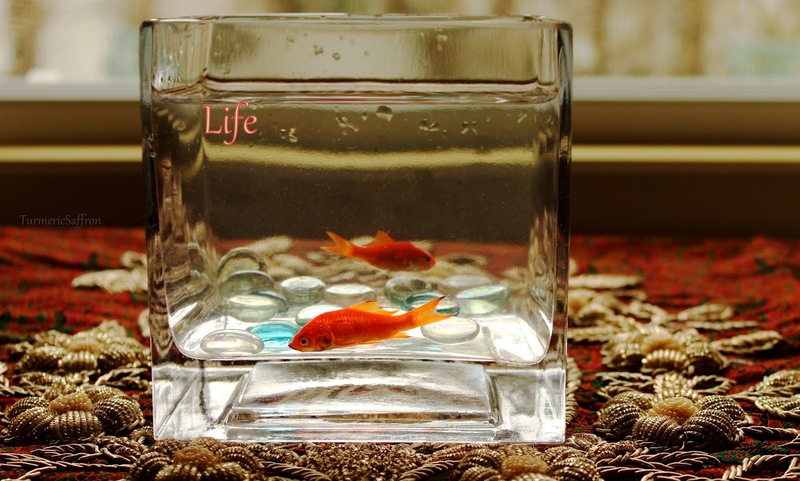 Plus, we can always use a little more mehr, light and good cheer in our lives. This festival also serves as a necessary reminder that similar to how the struggles and efforts of Kaveh Ahangar came to fruition beautifully, we too can overcome our personal challenges and obstacles. 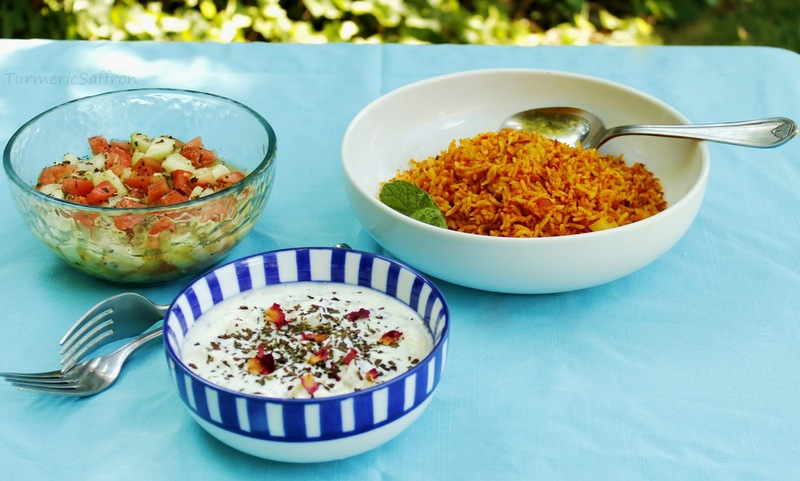 Food is an integral part of most celebrations and Mehregan is no exception. 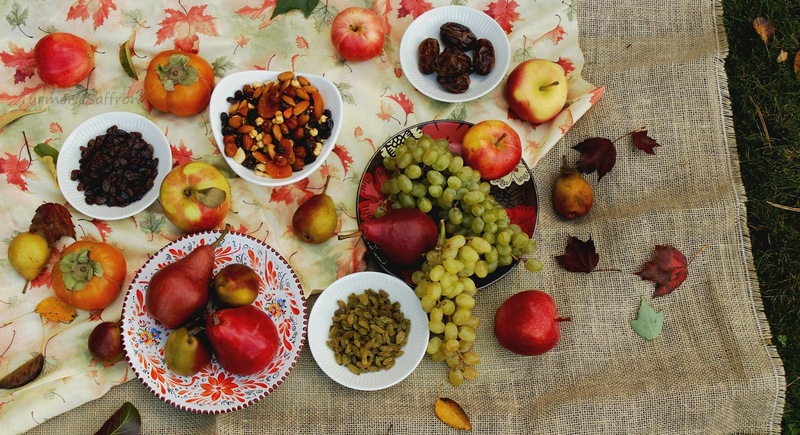 On this date, fresh fruits such as grapes, pomegranate, apples, quince, figs and persimmon were served along with an assortment of nuts, dried fruits, sweets and rosewater. 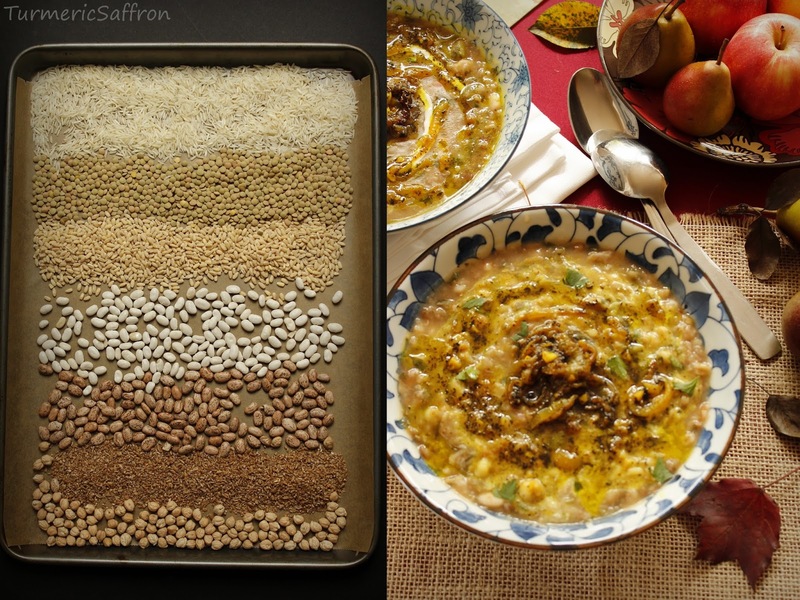 In my research for a Mehregan main dish I came across the آش هفت غله - Ash-e Haft Daneh (seven bean soup) in a few written records of a typical mehregan feast. And in my quest for preserving traditions I decided to recreate this recipe which was perhaps once served on our ancestral sofreh (spread). I chose to call it a seven bean soup but this is more than just a soup and it's more than just beans. 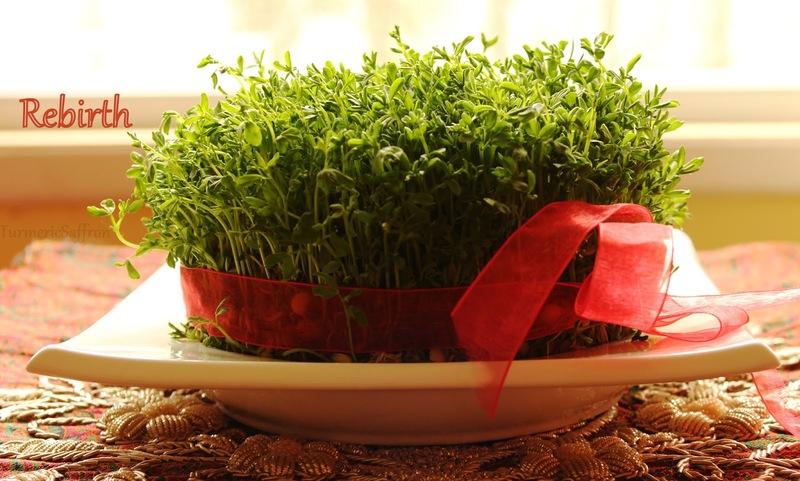 آش هفت دانه - Ash-e haft daneh is a combination of beans, seeds, whole wheat and some vegetables. 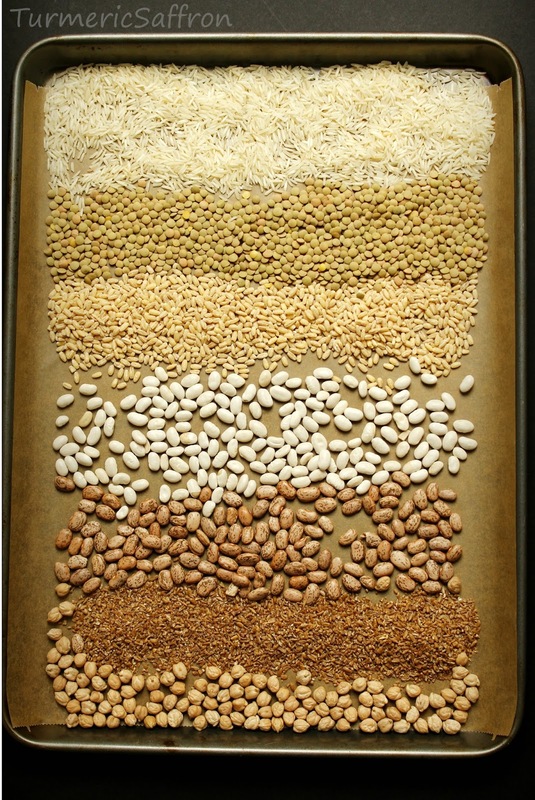 The main ingredients in the original recipe were listed as wheat, barley, rice, chickpeas, lentils, mung beans and millet. There are many different variations of this traditional ash (stew/soup). You can make this soup with lamb shank or lamb/beef stock and add vegetables such as parsley, cilantro, chives/leeks, spinach and dill. However, since this is a hearty and flavor-packed soup I didn't think adding any kind of meat was necessary. Also, it is not loaded with vegetables like ash-e reshteh and it does not have noodles either. I replaced millet and mung beans with two other kinds of beans and used tomatoes for added flavor. Place the chickpeas, pinto beans, white beans and barley in a large bowl, rinse, add a quart of water, soak for six hours. Drain and place in a large pot. Rinse the rice, lentils and bulgur and add to the pot. Add water to cover by at least two inches, bring to a boil over medium-high heat. Reduce the heat, cook for one hour over medium-low heat. Add the grated tomatoes with their juices to the pot. Heat 1/4 cup vegetable oil in a large pan over medium heat. Add the onions, saute for 20 minutes until golden, add the garlic and turmeric and saute for another 2-3 minutes. Add the dried mint, saute for an additional minute or two. Add parsley, chives and 1/2 of the sauteed onions to the pot. Add salt and pepper. Cover and cook for another 45-50 minutes on low heat or until the beans are all very tender. Add lemon juice toward the end of cooking. Add more water if needed and adjust the seasoning. Ladle ash into a serving bowl and top with kashk and fried onion. Serve hot with warm bread and yogurt. Happy Mehr & Happy Mehregan! 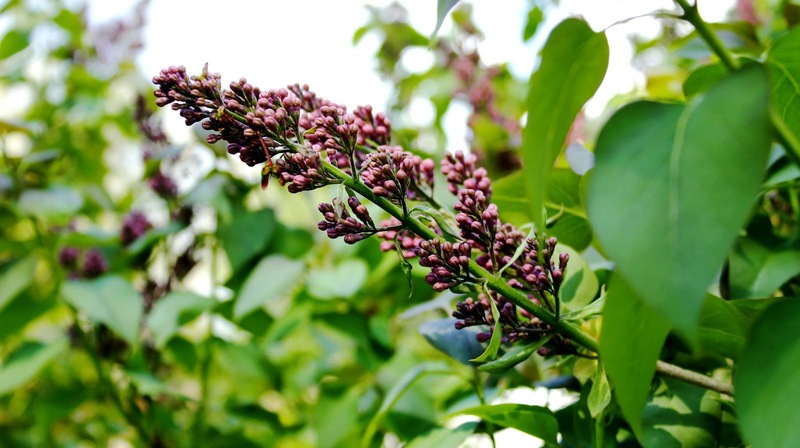 We are in the midst of خرما پزان - khorma pazan season, a term used by locals in the south of Iran when the temperature reaches its peak of 100+ degrees Fahrenheit combined with an elevated humidity above 60 percent, thus making outdoor activities unbearable. However, it's due to this intense heat that dates become fully ripened/"cooked" while on the tree and ready for harvest. 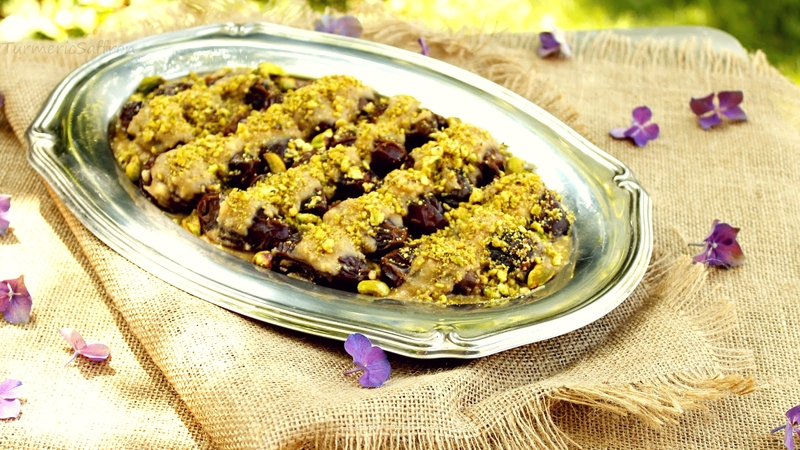 This recipe is an ode to the traditional Khuzestani-style رنگینک ranginak, a delicious date and walnut dessert. 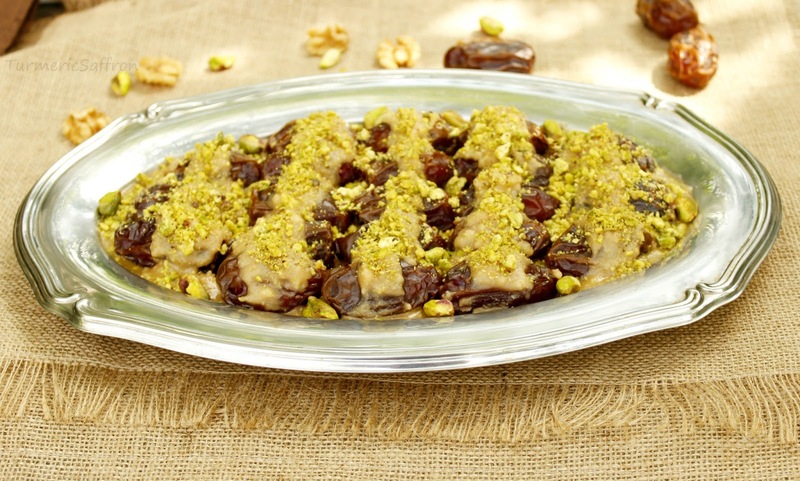 This is an easy recipe that requires just a little bit of patience to stuff the plump pitted dates with lightly toasted walnuts, arrange them onto a platter and slather them with a warm mixture of melted butter and flour infused with cardamom and cinnamon. The sweet taste of ranginak brings back memories of home. 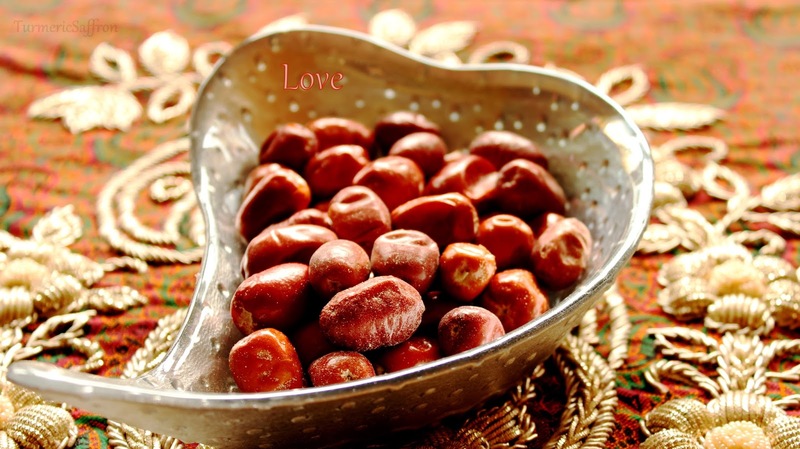 Dates have been a part of the Persian cuisine for hundreds of years. The palm dates grow southward along the Persian Gulf and the warm regions of Ilam, Bushehr, Fars, Khuzestan, Sistan & Baluchestan and Kerman. To most people, pomegranates may be considered the national fruit of Iran but in my opinion dates are the national fruit of Khuzestan! Many years have gone by since I lived there but it's the many images and memories that still run through my mind. 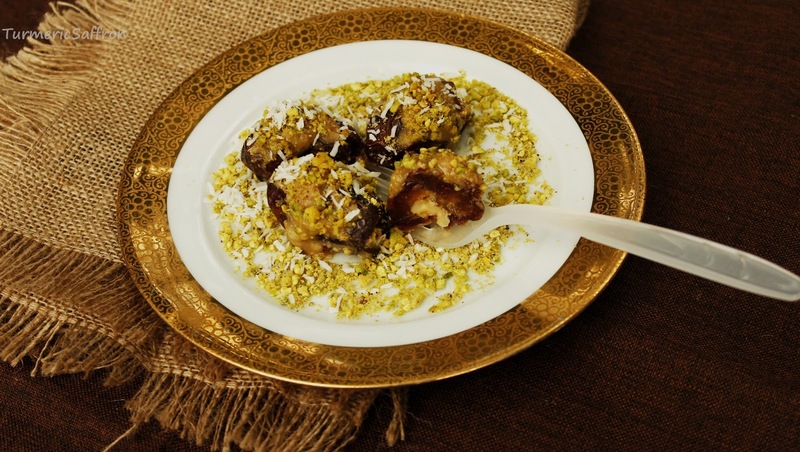 I remember Khoramshar's vast fields of date palms, the stacks of tin buckets filled with dates in small shops, barely-ripe or half-ripe bunches of dates spread about on the woven mat and then of course my mother's date dessert. 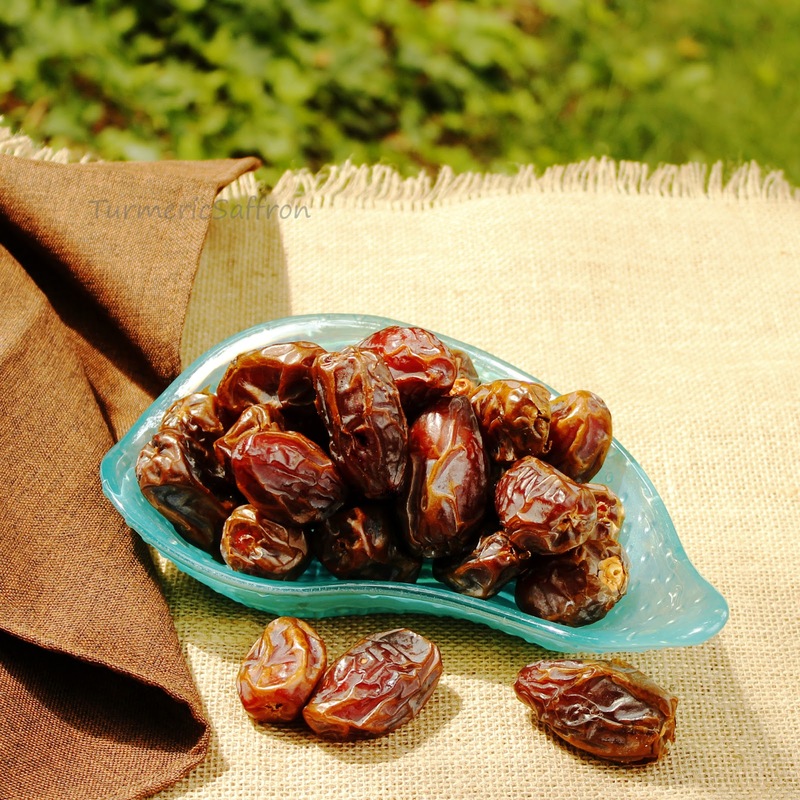 Dates were a snack for when we got home from school back then and now whether they are fresh, dried, large or small, dates will go perfectly with your hot cup of tea anytime of the day. They are so addictive that you'll be tempted to reach for a date with every sip and let the sweetness of the dates mingle with the aroma and slightly bitter taste of the strong, freshly brewed loose leaf chai. Dates are naturally sweet and substantially tastier than any other sweet fruits and they come in many different varieties and depending on when they are harvested dates may range from unripe to partially ripe or fully ripe. I wrote my mother's version of this recipe a long time ago which is a bit less time consuming than this version. In that recipe, instead of stuffing the dates one by one, you would combine them together and heat them through before you add the butter and flour mixture since you don't need to one by one stuff the dates with walnuts. My mother's approach to cooking was a no-fuss, no-frills way of cooking. On an ordinary day she had to prepare meals for her large family and cooking was the only thing that she did not like to delegate at all. Toast walnuts in a small dry skillet for 3-5 minutes over medium-low heat, stirring frequently until fragrant. remove Stuff the toasted walnuts into the cavity of the dates. In medium sized skillet toast the flour for about 5 minutes over medium heat, stirring frequently, until the edges turn a light golden brown. Add the butter and cook for 15-20 minutes over medium-low heat. Add the cinnamon, cardamom and sugar, stir well. Cook for 10 minutes over medium-low heat. Spread 1/2 of the batter on the bottom of the serving platter and arrange the stuffed dates in a single layer on the dish. Spread the remaining batter over the dates, gently press down. Garnish with pistachios. Let cool for a couple of hours. This recipe is perfect all year round since most pantries are always stocked with fresh tomatoes and canned tomato products. 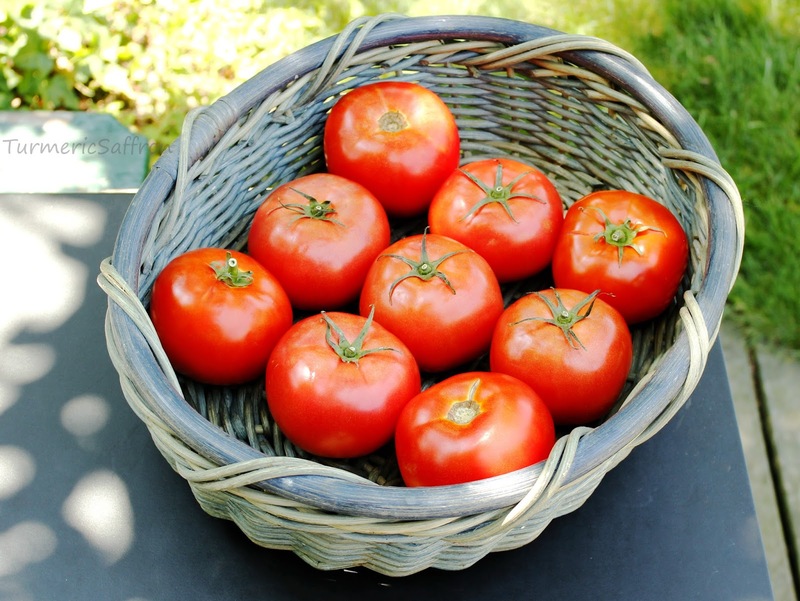 However, I waited for the weather to warm up and for the peak tomato season to arrive to hopefully cook with vine-ripened tomatoes and not the dull and tasteless tomatoes that are picked green. This recipe is loosely based on my grandmother's recipe who was known for her delicious cooking. For a more tart استامبولی پلو - estamboli polow recipe, I searched the vegetable markets for a good torsh (tangy) tomato but to no avail. Among all the different varieties of tomatoes that were available I settled on the beefsteak tomatoes due to their great flavor. 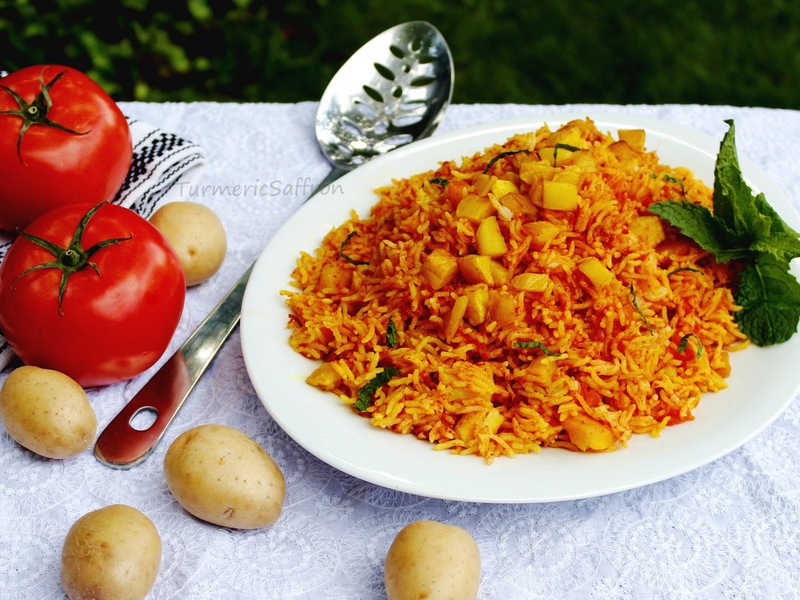 I prefer outdoor cooking in the hot summer months and try to minimize my standing in the kitchen as much as I can but this tomato rice is a perfect summer dish that goes well with grilled chicken, fish or vegetables. 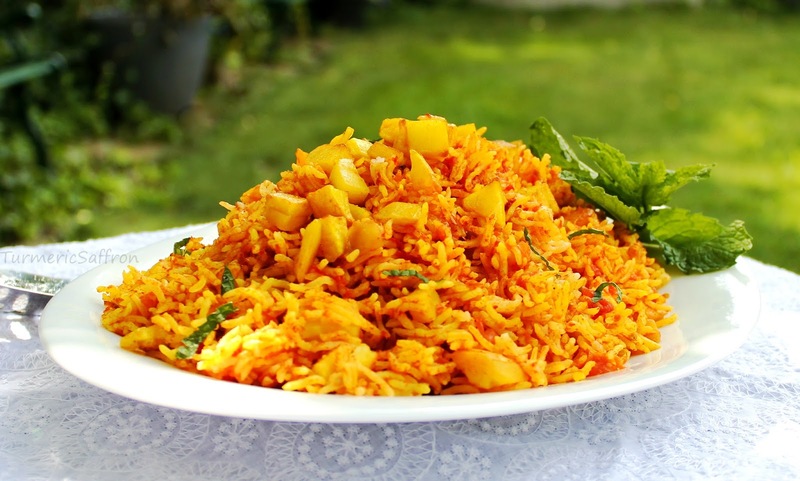 There are many recipes for estamboli polow from plain tomato rice to a rice complete with meat and green beans, depending on what part of the country you are from and how this was prepared in your home. For us, growing up in Khuzestan, estamboli meant کته تماته/گوجه فرنگی - kateh-ye tamate which is slow-cooked rice in tomato puree with the addition of small cubed potatoes using the long and narrow type of potato called estamboli in Iran. 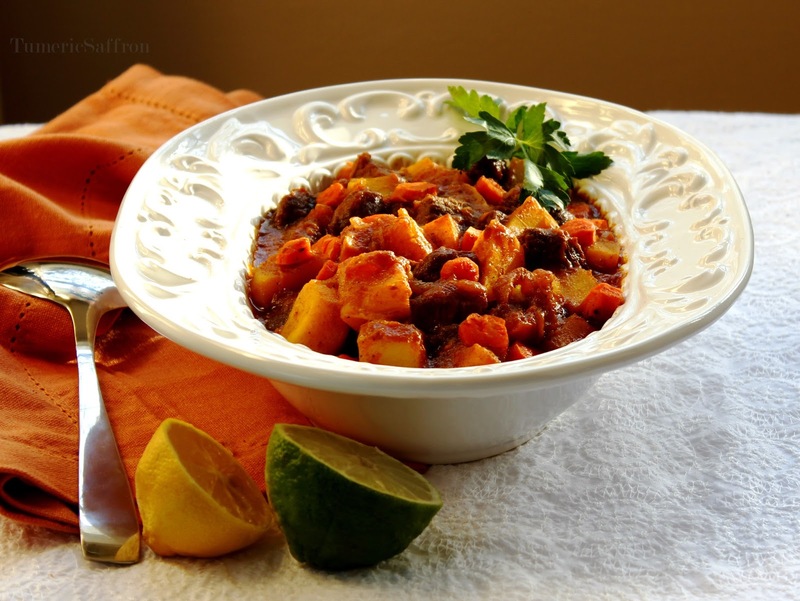 For a simpler estamboli you can even make it without adding the cubed potatoes. If you prefer a less acidic dish you can skip the tomato paste. Ultimately, it depends on your taste, diet, and food restrictions. In a pot of boiling water blanch the tomatoes for 5 minutes or until the skin comes off. Let cool, remove the skin, core the tomatoes and puree using a food processor. Yields about four cups. 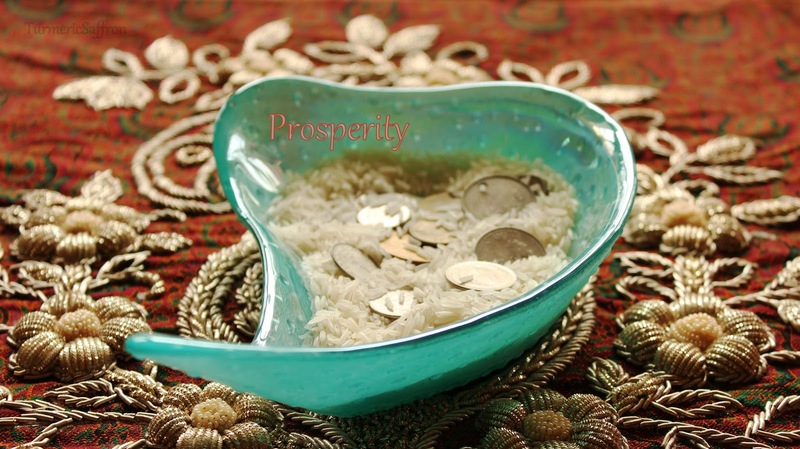 In a medium bowl wash the rice thoroughly until completely clean, drain completely. In a mixing bowl combine the well-drained rice with the tomato puree, mix well and let it soak for 20-30 minutes before cooking the rice. Do not drain. In a large pan, heat 3 tablespoons of vegetable oil over medium heat, add the onions, cook until golden. Add the potatoes, cook for about 5-7 minutes or until golden on all sides. add turmeric and a pinch of salt. Stir well. Push the potatoes to the side and add the tomato paste in the center of the pan and cook for about 5 minutes over medium-low heat, stirring frequently using a wooden spoon until it changes color. Remove the pan away from the heat source, add the rice and tomato mixture to the pot, add 1/4 cup of water, 1 teaspoon salt and a pinch of red pepper, stir well. Return the pan to the heat and bring to a boil over medium-high heat, add 1-2 tablespoons of butter or oil. Stir. Reduce the heat, cover the lid with a paper towel or a clean dish cloth, close the lid tightly and cook on low heat for 40 minutes. Over cooking and adding too much water makes the rice too mushy. 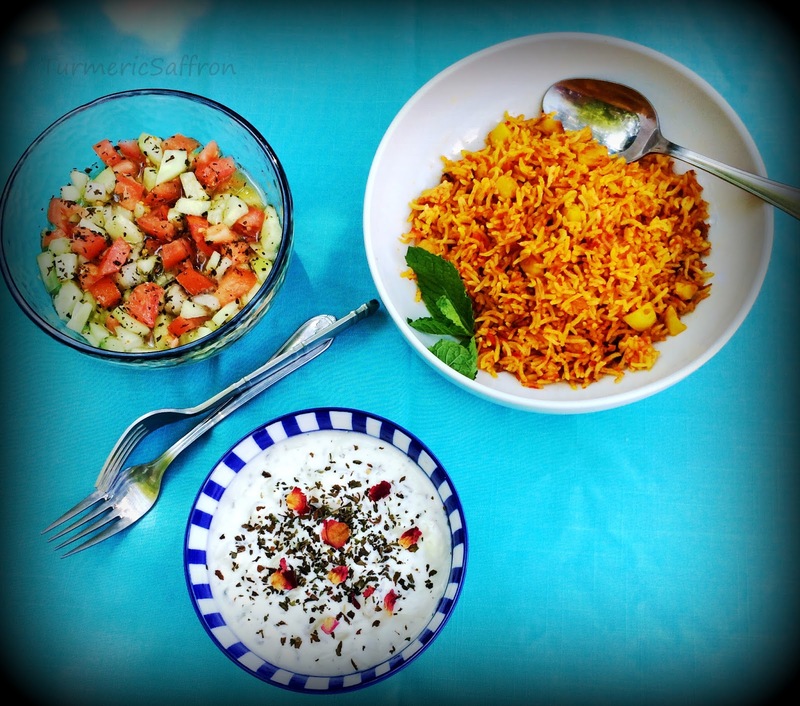 Serve with plain yogurt or mast o khiar, sabzi khordan with a bunch of fresh mint, and salad shirazi. 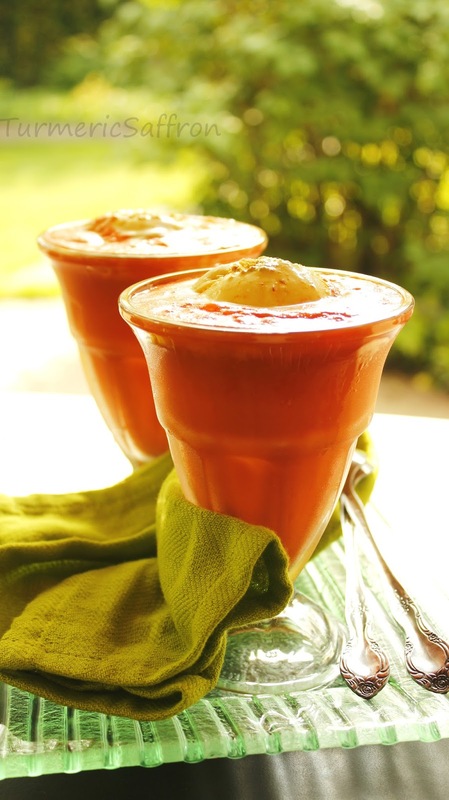 Summertime is officially upon us and a آب هویج و بستنی ab-haveej bastani (carrot juice ice cream float) is the perfect way to cool down on a hot day. 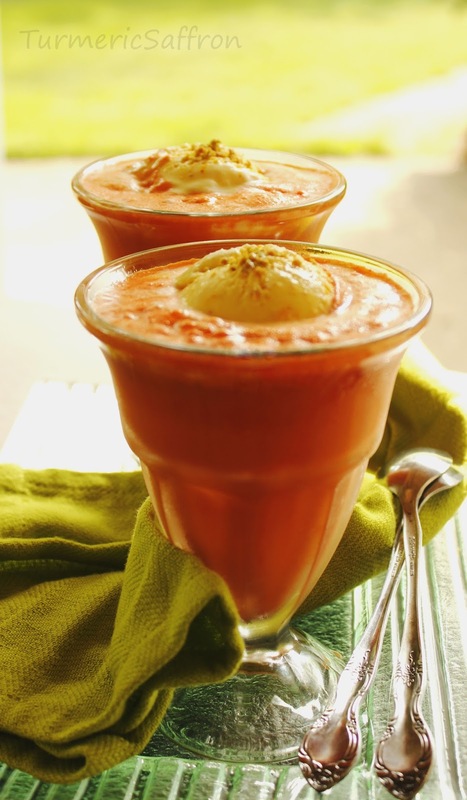 Carrot juice is refreshing, healthy and a great source of vitamin A all on its own. I initially made this recipe with plain vanilla ice cream but then decided to change it up for the next batch and make it with scoops of saffron ice cream instead. The addition of a little bit of saffron and a hint of rosewater greatly enhances the flavor and aroma of this treat. Carrots may have been around for hundreds of years but this recipe is relatively modern. 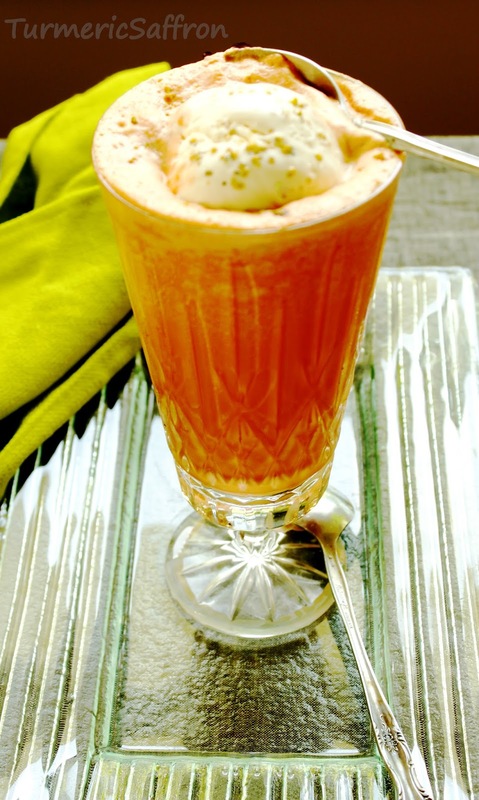 I'm not certain about the exact origin of this recipe but it seems to me that this is a different take on the European cafe glace (coffee with ice cream float) that became popular in the 1960's in Iran. I remember on one of our trips to my grandmother's house in Tehran, my sister took me to the upscale Chattanooga restaurant and that's where I had my first cafe glace. On the other hand, it's also quite possible that ab haveej bastani recipe was created by some ingenious Iranian chef in the past. It's been thought that by tapping into the collective consciousness people from different parts of the world may come up with the same results at the same time! 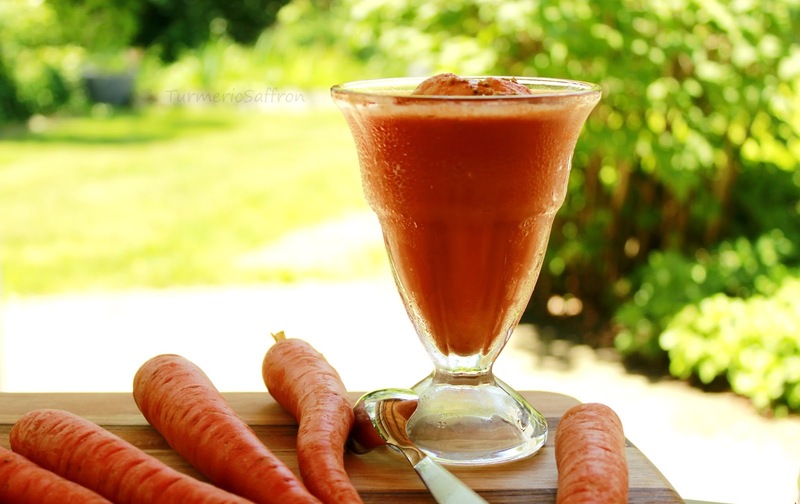 In our home carrot juice was served regularly and we all had to drink it whether we liked it or not and each time we were reminded that carrots are good for us and that they would improve our vision. Our juicer was archaic and pretty much a nightmare to clean. However, that wouldn't stop my mother from juicing almost anything frequently. زردک - Zardak meaning "the little yellow one" (wild carrots) go back about 5,000 years in Iran, Afghanistan and the neighboring lands. Zardak (yellow carrots) are sill cultivated mostly in the region of Isfahan in Iran but they are not as common and popular as haveej farangi (western carrots). Carrots are a staple in our home all year long and are on my list of foods to always keep in the fridge and luckily they are readily available in markets year round. The in season carrots, however, are more flavorful, tender and sweet. Carrots are a versatile vegetable that complement many recipes and are delicious when eaten raw, tossed into a summertime salad, salad olivieh, soup e jo, pickled or made into a delicious carrot halva. They are also great eaten alone or with a dip. Leave the ice cream out to soften. In a medium mixing bowl, combine the ice cream, liquid saffron, rosewater and mix well. Return ice cream back to freezer for 3-4 hours or until firm. Place your serving glasses in freezer to chill for 5 minutes. Juice the carrots. 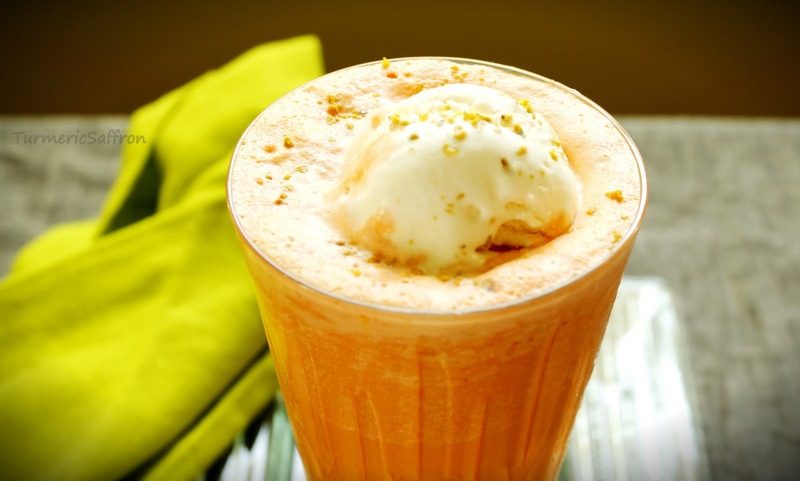 Add 2 scoops of saffron ice cream to each glass, pour the carrot juice over the ice cream, sprinkle with crushed pistachios and serve immediately. 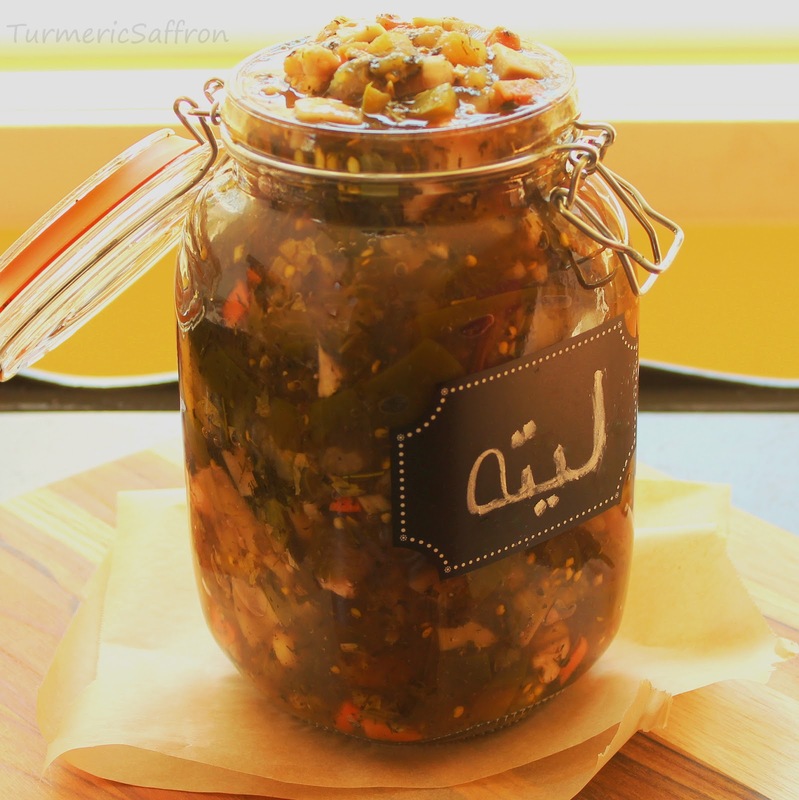 ترشی - Torshi (pickle) is a very common side dish in Persian cuisine served alongside rice and khoresh, kebobs and other traditional dishes. 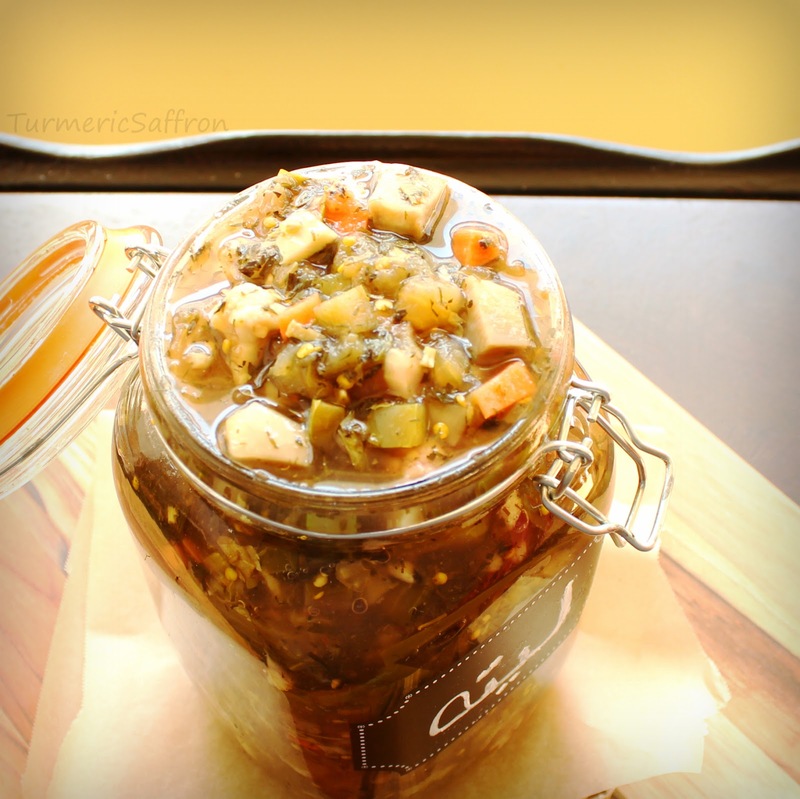 I have posted several of my favorite pickle recipes so far such as pickled eggplant and pickled vegetables among others. 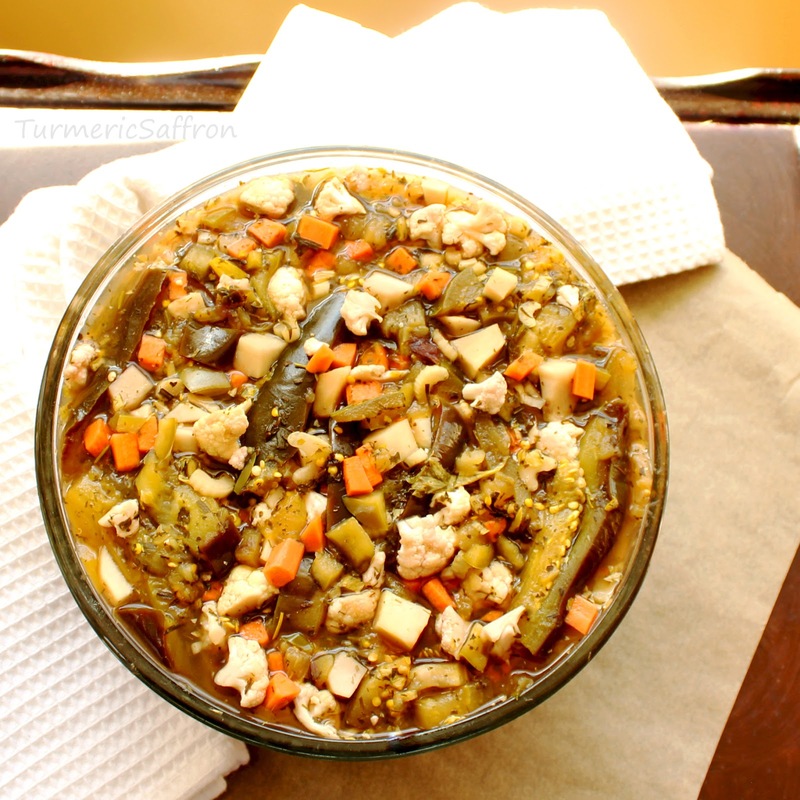 لیته - Liteh is a combination of pickled eggplant with a few other vegetables and herbs. For this recipe I'm thrilled to have finally found سیب زمینی ترشی - sibzamini torshi (pickling potato), also known as یارالماسی - yaralmasy in Iran. Sibzamini torshi, which is called sunchokes/Jerusalem chokes, is a member of the sunflower family and is not related to artichokes nor is it from Jerusalem. 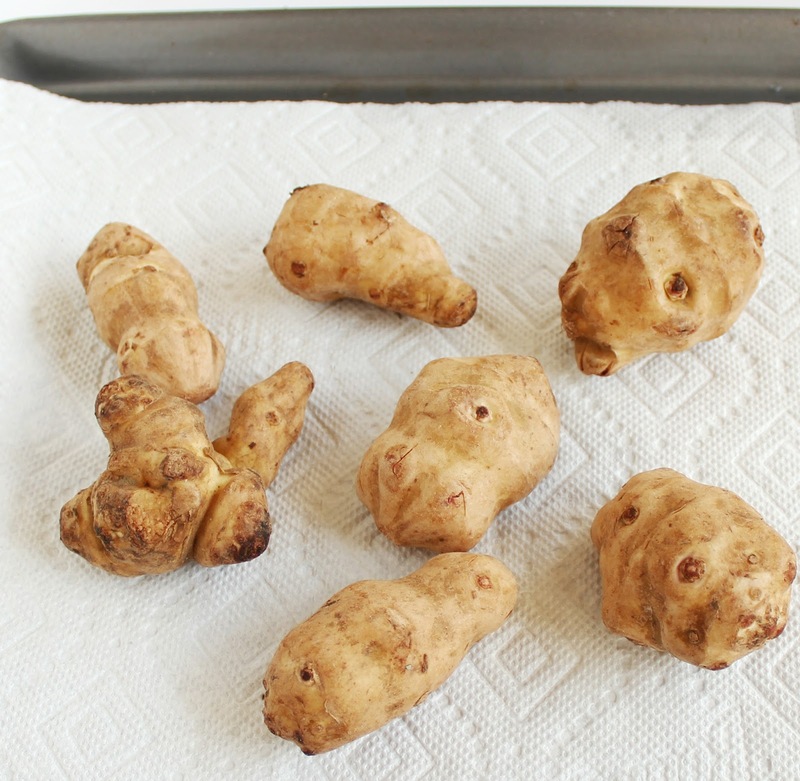 For further information please check out the following link on sunchokes. a nutty flavor and a bit of a crunch. If you are unable to find sunchokes in any vegetable markets just leave it out since liteh is traditionally made without it. For this recipe you can use grilled eggplant instead of having it simmered in vinegar.. If you use grilled eggplant, remove the skin, slice and combine with all the other ingredients. For the herbs, you can use fresh herbs if you prefer. I used dried herbs since I didn't have enough time after washing to lay them out to dry completely. Pour 1 cup of vinegar and a cup of water into a non-reactive saucepan, bring to a boil over medium heat, add the turmeric, eggplant and 1 teaspoon of salt, then reduce heat and simmer for 8-10 minutes. Remove the eggplant and place in a colander to drain. In a large mixing bowl, combine eggplant, sunchokes, carrots, celery, cauliflower, bell pepper, garlic, herb mix, spices and 3 teaspoons salt. Mix well. Pack the torshi into the clean and dried jars, pressing down, pour the vinegar over them up to about 1 inch from the top. Close the jars tightly and pickle for 10-12 days. 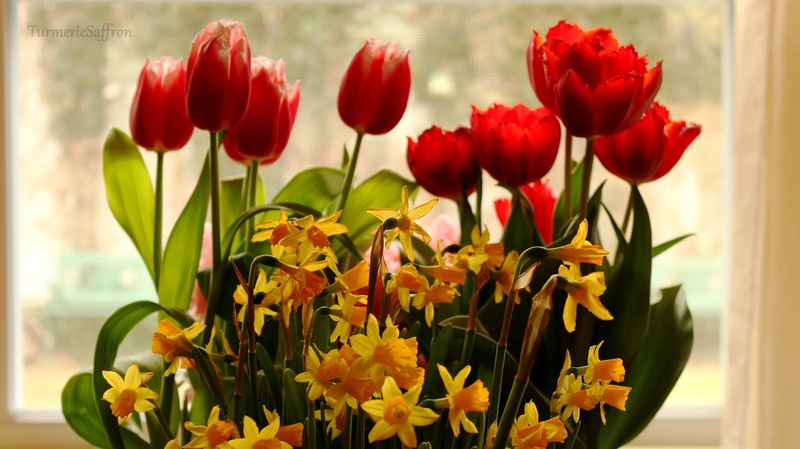 Wishing you all a very happy, healthy and prosperous Nowruz - Persian New Year. 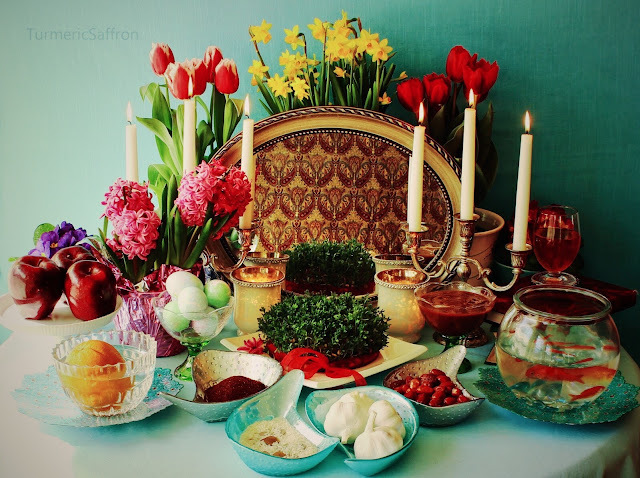 After a few days of preparation and Nowruz related activities I finally got a chance to gather all of my haft seen photos and share some of them with you. For me, there's such a joy in photographing a haft seen table, especially with loved ones included. 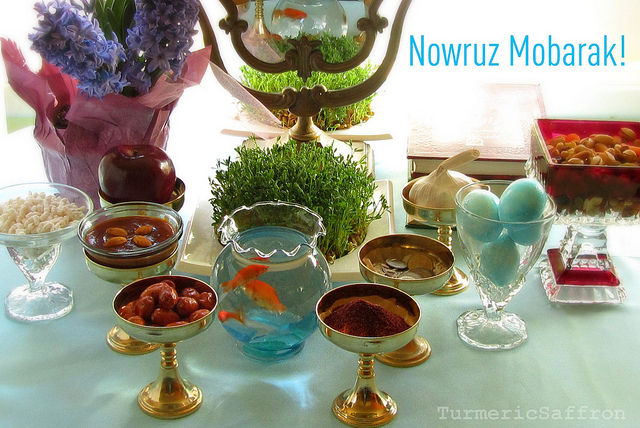 For more information about Nowruz and the haft seen you might want to check out this article Persian New Year's Table Celebrates Nature's Rebirth Deliciously on NPR's Blog. 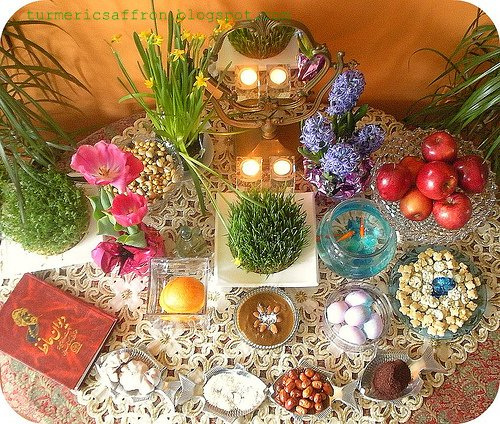 !نوروزتان خجسته و پیروز باد - Happy Nowruz!